The United States Department of Energy (U.S. DOE) has recently implemented a series of strategic initiatives to address long-term radiological surveillance needs at former U.S. nuclear test sites in the Marshall Islands . 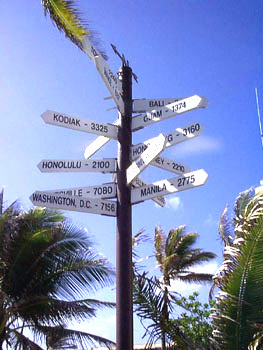 The plan is to engage local atoll communities in developing shared responsibilities for implementing radiation surveillance monitoring programs for resettled and resettling populations in the northern Marshall Islands. This web site provides an overview of the individual radiological surveillance programs currently being employed in the Marshall Islands along with a full disclosure of verified measurement data. A new feature of this updated web site includes a provision whereby users are able to calculate and track radiation doses delivered to volunteers (de-identified information only) participating in the Marshall Islands Radiological Surveillance Program. Twenty years later, the Fund is nearly bankrupt, raising the question: Has the United States fully remedied the harms of the nuclear testing, and if not, what else must it do? Based on a year of research, field work and interviews, Harvard Law Student Advocates for Human Rights concludes that, despite good-faith efforts on both sides, negative effects directly attributable to the U.S. testing have not yet been rectified. Most notably, some Marshallese are still unable to return to their homelands because of contamination, and many victims stricken with radiation-related cancers will receive partial compensation or no compensation at all. The report also finds that basic treatment for nearly all radiation-related cancer victims is subject to the discretionary -- and at times, arbitrary -- decisions made by government officials and foreign hospitals because the Marshall Islands lacks the facilities and expertise to treat such conditions. Without U.S. support, cancer victims with five-year survival rates below 50% are refused funding for treatment and left with no chance of being cured. Finally, the report concludes that the United States has assumed the obligation -- under both international law and bilateral agreements -- to provide just and adequate compensation for the nuclear testing program’s damages to the people and property of the Marshall Islands. Rongelap's independent scientist Bernd Franke is convinced that Rongelap Island is ready for resettlement as soon as the rest of the island is fertilized with potassium. “The Rongelap people can go back to their island if they want,” the scientific director of the Institute for Energy and Environmental Research in Heidelberg, Germany, told the Journal, as well as to the Rongelap people in the recent community meetings. The Rongelap community was informed about the new state of art of the possibilities for the resettlement of Rongelap Island, because new scientific findings of both the U.S. Department of Energy (DOE) and independent scientific experts agree that Rongelap Island can be safely reinhabited. Franke is one of the independent scientific experts who was hired to check DOE’s data. Historically, Rongelap people have had a high degree of mistrust because of being wrongly informed by the U.S. government in the past. Franke has a good reputation and a high credibility in the Rongelap community because he served in the independent scientific team in 1988 that did research on Rongelap contamination. Proving the DOE’s analysis wrong at that time led to the $45 million trust fund that the U.S. Congress established in 1996 for the necessary clean-up prior to resettlement. According to Franke’s actual recommendation concerning the resettlement there is one last thing to do before Rongelap people can go back: The second half of Rongelap Island should be fertilized with potassium which would probably cost between $100,000 and $200,000. Study into cancer rates among Australian veterans exposed to radiation during British nuclear tests in the 1950s and '60s has found their incidence of cancer 23 per cent higher than the general population. The British nuclear tests were carried out on the Monte Bello islands off Western Australia, and at Maralinga and Emu Field in South Australia between 1952 and 1963. The findings, which have not yet been released by the Government but have been obtained by the Herald, show the overall death rate among participants was similar to that of the general population. But death from cancer was 18 per cent greater among test participants than among the general population. It found a significant increase in the number of deaths from, and cases of, cancers of the lip, oral cavity and pharynx, lung cancer, colorectal cancer and prostate cancer. Cancer cases, but not deaths, were also significantly greater among participants for esophageal cancer, melanoma and leukemia. Over the more than five decades since radioactive fallout was first recognized as a potential public-health risk, it has stimulated interdisciplinary research in areas of science as diverse as nuclear and radiation physics, chemistry, statistics, ecology, meteorology, genetics, cell biology, physiology, exposure and risk assessment, and epidemiology. Individual radionuclides in fallout were recognized early on as opportune tracers by which the kinetic behavior of elements could be studied, both among components of ecosystems and in their transport to people. The phenomenon of fallout, while contributing only modestly to our overall understanding of radiation risks, has taught us much about pathways of exposure and about cancer risks to the public in settings outside the medical and occupational arenas. We estimate that in the U.S. the primary cancer risks from past exposure to radioactive fallout are thyroid cancer and leukemia, whereas in a very few cases -- for example, the Marshall Islands -- large internal doses as a result of ingestion of radionuclides have led to significant risks of cancers in the stomach and colon. Our research has quantified the likely number of cancer cases to be expected in the U.S. from Nevada exposures and has contributed to the assessment of risk at other worldwide locations.